The Goldwing GL1800 which debuted in 2001, after eight years of intensive research and development, added further dynamic ability and riding enjoyment to the Goldwing's repertoire. The box-section aluminium frame delivered stability and accurate steering at speed. It also worked with the unique flat-six engine to keep the centre of gravity low - a key factor in the bike's excellent low-speed balance and agility, which made twisting mountain roads or busy city streets a pleasure to negotiate. The core appeal of the Goldwing remains its unique ability to make long-distance travel a truly rewarding and enjoyable experience. A visual update in 2011 - with improved luggage capacity-under the style concept of 'majestic aggression' perfected a look that is at once elegant, imposing and vibrant. The Goldwing's front fairing features a strong diagonal styling element that accentuates the strong lines of the twin-spar frame, running down the sides of the bike from the headlights to the pannier cases. The result is a dynamic look with sharp surfaces and sleek forms. 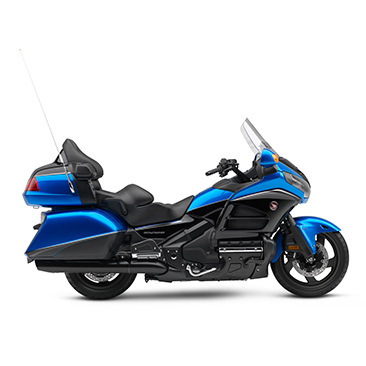 The seat is one of the most important features of a touring motorcycle and the Goldwing has always excelled when it comes to day-long comfort. The shape of the seat wraps around the passenger, creating the sensation of complete comfort and security. A urethane seat material increases comfort, while the weather proof cover is perforated for a sporty look. The horizontally opposed SOHC 2-valve six-cylinder engine is as much a part of the Goldwing legend as the name or the sales success. Unique in motorcycling, the 1832cm3 engine is the perfect long-distance ally. Its layout minimises engine vibration and helps create a low centre of gravity, reducing rider fatigue at speed and making the bike easy to handle at walking pace. At the same time the large displacement gives exceptional power and torque, especially in the midrange. PGM-FI fuel injection ensures a crisp throttle response and low exhaust gas emissions. Together, the fuel injection system's fine air/fuel ratio control, the three-way catalytic converter and the air injection system - that encourages the oxidisation of unburned gases. For longer maintenance intervals, automatic adjustment for the silent cam chain has been retained. The engine's power is transmitted to the rear wheel through a five-speed gearbox spinning the opposite way to the engine's crankshaft. This cancels out the side-to-side torque reaction effect generated by longitudinally mounted engines. Fifth gear is an overdrive, offering very low cruising revs on a long haul for optimised comfort and reduced fuel consumption. Shaft final drive means no messy chain lubrication or adjustment. The skeleton of the Goldwing is a twin-spar aluminium beam frame which holds the engine as a stressed member, improving its already outstanding levels of rigidity, while the design's low weight and optimised weight distribution make it a joy to ride at any speed. Both the 45mm cartridge front telescopic forks and Pro-Link single-side swingarm rear suspension use low-friction bushes, with the forks also benefitting from low-friction dust seals. Equipped with a two-position memory function, the computer-controlled, electric hydraulic-type adjustable rear suspension allows for quick adjustments to spring preload depending on load. 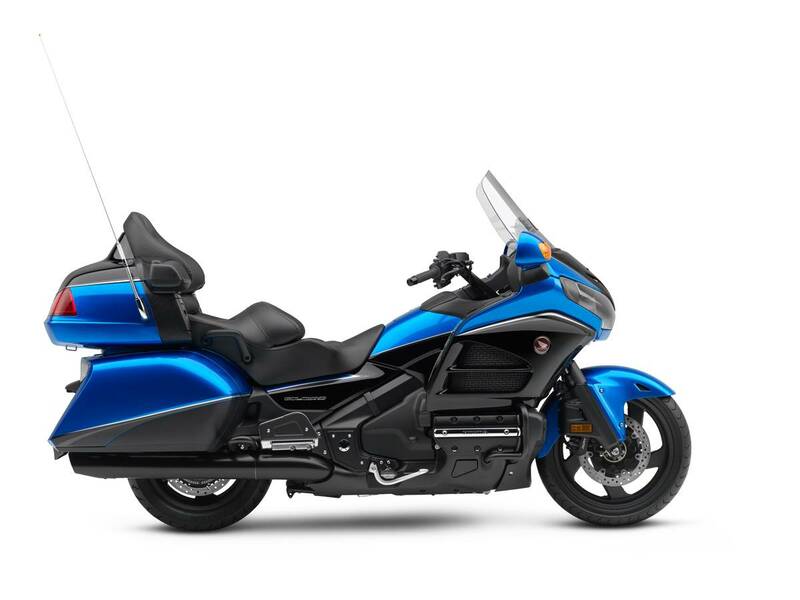 The Goldwing is fitted with Honda's Dual Combined ABS. The Combined element of the system links the front and rear brakes to deliver the perfect balance of braking effort, whether the rider uses the front brake lever or the rear foot brake for high levels of deceleration in all situations. Braking effort is momentarily reduced should the system detect that a wheel is about to lock up. Available in Glint Wave Blue Metallic.